コメント機能停止中のため、ご連絡はメールかTwitterでどうぞ。Comment function disabled: please contact me via email or Twitter. Apple notified me that Chordy doesn't follow current review guidelines because it has not been updated for a long time. I decided not to update the app, so it will be removed from the App Store in a few weeks. Chordy 2 v1.1 update is released. Here I explain the custom voicing related functions. Tap the circle V icon at the top right of the screen (above the chord pads) to display the Voicing Settings panel. When "Align to Lowest" is checked, all chord pads share the lowest bass note of them. Mutes the specified degree when chord is selected (can be canceled with a single tap). It is convenient when you frequently use power chords or jazz chords. 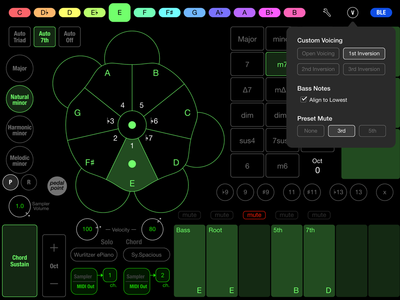 MIDI controller app M-Chordy is released today! 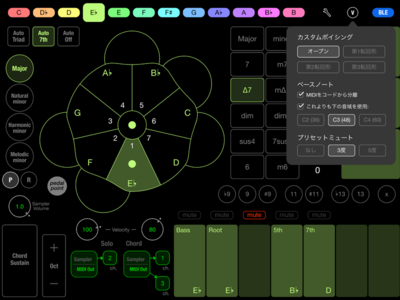 I am planning to stop the delivery of GridChord by the end of this month. - MIDI channel setting is now available. In the performance of Chord Tone Pads only, sounds are not affected by the latch. But if you play them with Chord Pads when the latch is ON, some notes may be sustained on some instruments. This is because Chord Tone Pads do not send note-off to the note being played and sustained on Chord Pads. If this annoys you, I recommend you to play Chord Tone Pads along with the 8vb Chord Pad, because they do not share the same note.